Last night, during the Family Equality Council’s 10th annual Night at the Pier, the organization dedicated to advocating for LGBTQ families honored filmmaker Lee Daniels who is also an openly gay father of twins. It seemed especially appropriate since his most recent hit, the TV show Empire, depicts a family with an openly gay son, Jamal, played by gay actor Jussie Smollett. Family Equality Council Executive Director Gabriel Blau also gave a moving speech at the event, telling the story about when he was on the Supreme Court steps the day of the family equality arguments, where just 20 feet away, speakers at an anti-LGBTQ family rally spoke of “faith.” As Blau points out, however, that group uses “faith” to scare, while his organization uses “faith” to unite. 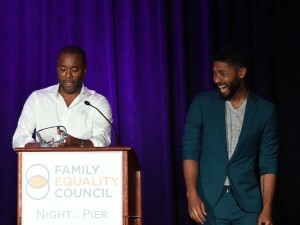 Read the full story at Out.com by Jerry Portwood at http://www.out.com/popnography/2015/5/12/jussie-smollett-praises-lee-daniels-his-gay-father .